Rochester Regional Health in partnership with Rochester Primary Care Network celebrates National Health Center Week 2018. The national campaign, which takes place during the week of August 12-18, raises awareness about the mission and accomplishments of America’s Health Centers and the dedicated staff who bring healthcare to the medically underserved. RRH has 21 Federally Qualified Health Centers (FQHCs) that are part of a nationwide network of health centers that now serve more than 28 million patients according to new federal data. RRH served over 85,000 patients at our health centers in 2017. The FQHCs are part of the Primary Care Institute under the leadership of Dr. Bridgette Wiefling. The heroes who work at our health centers at help make affordable healthcare possible for people in need. Working together, healthcare heroes produce innovative solutions to the most pressing healthcare issues in our community. They reach beyond the walls of conventional medicine to address the factors that may cause sicknesses, such as lack of nutrition, mental illness, homelessness and substance use disorders. It is their work that has helped reduce health care costs and reduce chronic disease. Services provided at RRH sites consist of zip codes from Monroe and Wayne counties. In three years, RRH has increased access to patients across Monroe and Wayne counties. FQHC’S are RRH’s primary care safety net providers. Our health centers provide comprehensive primary healthcare and other services. Health centers are non-profit, community-oriented healthcare providers. Generally, they are a subset of Federally Qualified Health Centers, institutions that receive special funding because they provide medical care to underserved populations. They offer preventative and primary healthcare, including physical exams, routine testing and screening, immunizations, dental care, pediatrics, women’s health, prenatal care, and nutritional services. These health centers are open to all but designed to reach out to underserved populations, especially low-income individuals, racial and ethnic minorities, recent immigrants, and rural populations. Our health centers are also on the front lines dealing with complex issues: substance use disorders, including opioid addiction, low birth weights among newborns, hypertension and obesity in economically challenged neighborhoods – health conditions that, if left unchecked, end up in hospital emergency rooms for costly treatment. They provide a wide-range of primary care services in one location to make it easy for patients, including pharmacy, dental, geriatric or pediatric care, and even counseling. 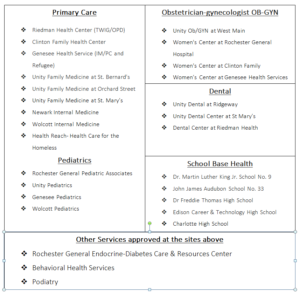 Our FQHC’s provide tremendous value and positively impacts the Rochester community. More than 448 people work at our health centers in positions that include clinicians, nurses, pharmacists, social workers, dentists and dental hygienists, behavioral health specialists, community health workers, and much more. Posted August 16, 2018 under _Featured Stories List, Leaders / Managers, Locations, News, Nurses, Physicians, Weekly Beat.